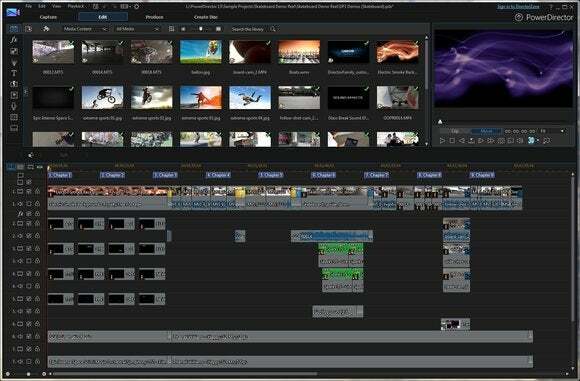 The latest version of Cyberlink’s flagship video/photo/audio creative bundle, Director Suite 3, adds more granular editing of titles and transitions, sports numerous improvements and tweaks, and now supports the latest video formats: H.265/HEVC and XAVC-S. 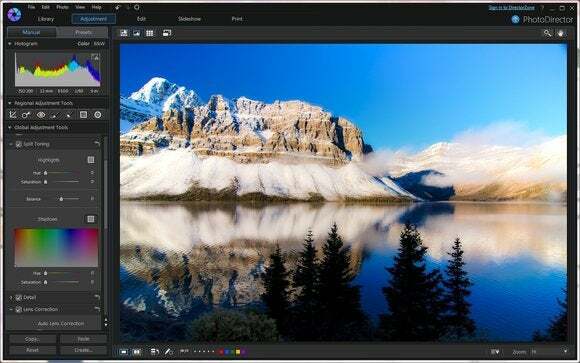 If not quite as powerful, it’s a more affordable and compelling competitor to Adobe’s Creative Cloud. 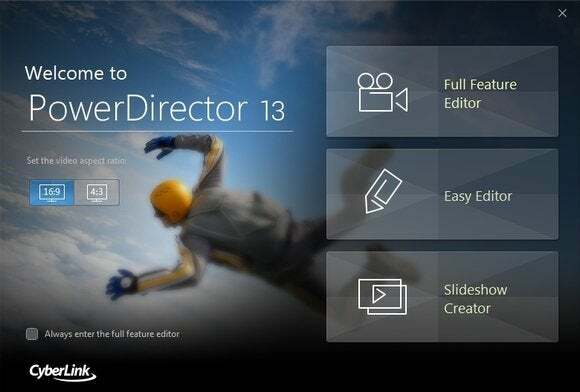 Director Suite 13 consists of PowerDirector 13, a pro-level video editing and production tool; ColorDirector 3, which applies color FX and tweaks to video; PhotoDirector 6, a top-notch photo editor; and AudioDirector 5, which facilitates deep editing of sound tracks. Though the suite doesn’t have every advanced feature found in programs such as Light Room, Final Cut Pro, Premiere or Pro Tools (audio), and is a feature or two shy of Creative Cloud, it’s easily capable of producing professional results. As I shoot a lot of iffy video, I headed first to PowerDirector 13’s improved TrueTheater video image stabilization and ColorDirector 3’s split-tone video editing. The video stabilization works considerably better than previous iterations, producing fewer compensation artifacts such as jumps and black borders. The results compare quite well with what I’ve seen from ProDAD’s Mercali and VirtualDub/Deshaker. The split-tone editing allows you to adjust color and levels separately for highlights and shadows. It’s a simple thing, but it makes solving color problems in video much, much easier. PhotoDirector 6 has gained a very intelligent and effective (but rather slow) panorama builder that handles photos of the same subject that don’t necessarily share a horizon line, and a face swapper that allows you to utilize or merge the best expressions from a series of photos. Yes, you can take the one photo where junior isn’t crying and put his face in the one photo where you’re not exasperated to fool the grandparents. On the other hand, I was nonplussed that the PhotoDirector 6 wouldn’t import a .png file. That’s a pretty common format to be omitting these days. Cyberlink comes close to universal support of audio and video formats, but is still dragging its heels when it comes to image formats. 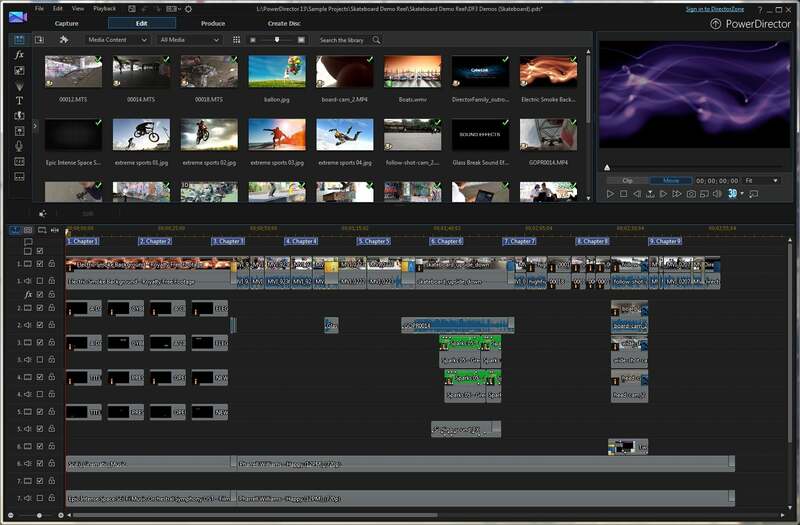 More granular title and transition editing makes PowerDirector 13 even more powerful. H.265 and XAVC-S are now supported as well. If you were hoping your voiceover would sound like Joan Sutherland, but wound up with Pavrotti, AudioDirector 5 now has a gender-bender function. You can transform a bass into a soprano, or a soprano into a robot. Add that to the existing excellent noise reduction by Izotope and the ability to utilize industry standard VST FX, and you have nice little audio toolkit. 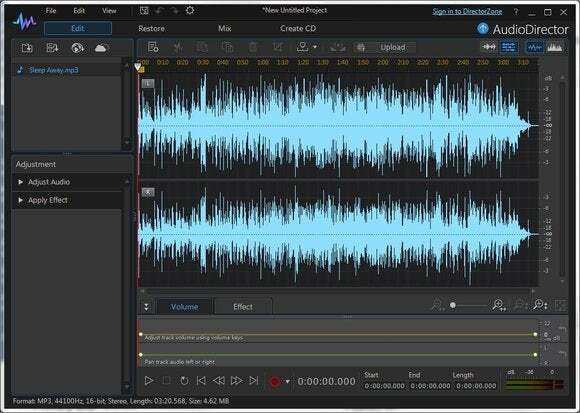 AudioDirector 5 is also capable of multitrack recording as well. Another nice add is support for Apple’s lossless codec, which should make classical music lovers, who avoid compression if at all possible, happy. As to the new video-related editors: There’s now a Transition Designer that allows you to create transitions using any image, and also offers cropping, editable border colors, and keyframe control. There’s also a more robust Title Designer, which shares the new keyframe control and allows animations, gradients and several other new tweaks. Considering that you’re going to win or lose a lot of viewers as the titles roll, more granular control is an important addition. With support for VST FX and its own noise reduction and voice transformation, AudioDirector 5 has come a long way. Another improvement to the video editor is the ability to sync up to 100 different cameras in MultiCam view so you can create the video wall to end all video walls. Other notable, albeit existing, features include motion tracking and motion FX, HDR enhancement, 3D support, and production to disk or any sort of optical media. There’s also content-aware editing which shows you in a layout where there’s speech, audio, shaky video, faces, etc. which can substantially quicken the editing process. On the other hand, it’s getting to the point where to be a truly efficient production tool, PowerDirector needs inline color and audio editing. While the programs in the suite communicate and seamlessly transport data back and forth, it’s still a time consuming process to export data, open another program, import the data, re-export the edited results, then reopen them in the originating program. The lag disrupts the creative process. Here’s hoping there’s single CreativeDirector program that marries all the editors in the offing. Also, with the ever increasing number of features, PowerDirector’s tiny monochromatic icons and lengthy context menus can be daunting for new users, and inefficient even for those that know the program. The learning curve is steep. To be fair, PowerDirector is no worse in this regard than most of the competition. PhotoDirector 6 now allows face swapping and builds panoramas from photos that don’t share the same horizon line. Cyberlink has largely transitioned to a per annum revenue model, though you may also buy the standalone version of the suite for $299. The yearly fee is $99.95, and you can “rent” the suite for three months for $49.95. All versions include 20GB of online storage for the subscription length, or a year for the standalone. To be clear, these are simply the applications installed on your hard drive that check in online once in a while to make sure you’re paid up. It’s not a Web-app collection that you utilize via a browser. Also note that the individual applications are all available separately. Director Suite 3 as a standalone upgrade is a pick’em based on need for existing owners. If you’re a new customer, you won’t find this kind of creative power elsewhere for anywhere near the price. If you’re a subscriber, it’s all free, and it’s all good.